Gordon Huntley Man was born on 23 March 1925 in Derby, the son of John Horace Cowper Man and Annie (Dolly) Hodgkinson. He married Edna Noel Toon on 29 March 1948 in St. Peters Church, Stapenhill, Burton on Trent, Staffordshire . Gordon died on 24 October 2008 at his home in Stapenhill, Burton on Trent. Edna was born on 16 December 1924 in Burton-on-Trent. She died on 12 April 2016 at Queens Hospital, Burton on Trent. Gordon and Edna belong to Generation Nine; their two sons belong to Generation Ten and are living. To read Gordon’s recollections of the years 1947-1948 please click HERE (<— pdf). Stephen Man’s funeral oration for his father Gordon. Gordon Huntley Man 23rd March 1925 – 24th October 2008 Throughout his lifetime, Gordon was a very gentle and kind man with strong family values and a strong sense of decency, integrity, fairness and love. He was born on 23rd March 1925 in Abbey St Derby, second son of Horace and Annie Man; younger brother of Will and elder brother of Mary, who are both here today. As a young man, Gordon was often getting into minor scrapes – he once fell into Alvaston lake and denied that he’d been in the water in spite of being covered in green slime and was with brother Will happily kicking stones along Victory Road in Derby when one was kicked straight through the headlight of a brand new Rolls Royce as it was being driven out of the factory gate. He was a keen cyclist as a young man and often headed off alone into the Peak District on cycling adventures. He took a cycling holiday alone in Wales and cycled daily from Mickleover to Burton and back to work firstly in the LMS No4 Bonded Warehouse and later at the Horninglow Street Railway Offices, where he met wife Edna in 1941. Gordon was called up to the RAF in 1943 and enlisted at Lords Cricket Ground in St John’s Wood London from where he was billeted in Hall Road NW8. He served in many parts of the UK as a radio operator and often related tales of journeys home on leave, joining trains at the very back at St Pancras and then dashing to the front whilst stopped at Mill Hill Broadway or Elstree & Borehamwood to avoid the ticket collector. One has to assume that no valid ticket or travel warrant was held! Gordon was posted to New Delhi in 1945 along with many other forces at the end of the Second World War to help deal with the unrest in India in the period leading up to partition. He was ultimately based in Peshawar in the North West Territories on the border with Afghanistan in what is now Pakistan. Gordon had been due to be posted to Okinawa but this had been cancelled with the detonation of the H Bombs at Hiroshima and Nagasaki in 1945. He had many vivid memories of his time in India and Gordon as recorded these in a piece that can be found on the Man family website. He contracted Tuberculosis in 1947 in Peshawar and there was an argument between the British and Indian medics about his diagnosis. Fortunately the Indians won the argument and their correct diagnosis of TB led to Gordon being dispatched back home to England. This entailed a three day train journey to Bombay to find he had missed his ship and had to wait three weeks for the s.s. Franconia to take him to Liverpool. He was violently ill throughout the journey and because of his contagious condition was lashed to fixtures on the deck for the entire voyage. On return to England Gordon weighed in at just eight stone and was hospitalised firstly at Kirkham near Blackpool where his condition was confirmed in the RAF hospital there. Gordon secured leave from Kirkham in March 1948 to marry the love of his life Edna. Gordon was quickly into the freedom thing and the tender embrace of his new wife and went AWOL so they could have a short honeymoon together in Buxton. After a spell back at Kirkham and the wrath of the C.O. it was then by train in an Ambulance Carriage from Preston to Euston, across London by ambulance and then by ambulance carriage from Victoria to Midhurst in Sussex, near Goodwood racecourse, for surgery and further treatment. Gordon was later transferred to Wroughton near Swindon to complete his recovery from the TB that had nearly killed him. He was discharged in 1949 and resumed his railway career in 1950 where he worked in various positions at Moseley Street, Burton, Derby and finally Nottingham where he retired as a Railway Manager in the freight marketing section of the Divisional Managers Office. Gordon’s family are delighted to see his former boss Stan Vickerstaff and colleagues here to day. Life was not all War, Work and Illness. There were many family holidays; Blackpool, Wales twice, Cornwall four times, Guernsey, Isle of Wight, Switzerland Austria, Italy – all wonderful family occasions that brought so many special memories and were the envy of many of the kids at school! There were many day trips to London too usually made more difficult than they should have been by one or other of the boys needing the loo IMMEDIATELY the doors closed on the tube train! Gordon played Father Christmas at Short Street School and completely fooled both boys but got a clip round the ear from his mother who thought he was a bit of a chancer after her money! Her performed similar duties at Emmanuel Church where he was a member for 34 years and the first Church Warden there, a role he performed for 15 unbroken years. 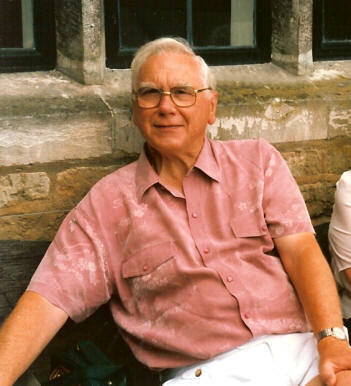 He was a great servant to the church – painter, decorator, drain rodder, electrician, plumber, cleaner and so on. He loved that church and the family are delighted that Rev Nigel Pearson, formerly the vicar at Emmanuel, is here today. Gordon was a very keen gardener and won many prizes from Burton Council for best garden in the area, once winning the first prize. In later life he came to love his home and although he enjoyed holidays in America three times and one to Canada, as well as annual UK breaks, he always loved to be back at home. Home was the place in which Gordon died – the only place he really loved to be with his family. He knew he was there and we are thankful for that.